The 2017 Ecoboost Turbo has the 310hp 2.3L EcoBoost turbo 4-cylinder engine (10hp more than the standard 2017 Mustang V6 engine). Option packages include the Equipment Group 201A (Shaker Pro Audio System, driver's seat and sideview mirror memory feature, ambient lighting and blind spot information system), EcoBoost Performance Package (awesome exterior and performance upgrade), Enhanced Security Package, Interior and Wheel Package, Pony Package (only for the EcoBoost Premium), Premier Trim with Cloth Accent Group, and Wheel and Stripe Package. George sent us pictures of his 2017 Magnetic Mustang. George sated, "Purchased in 08/18 from a GMC dealer who had it on the lot. They had it priced very well as it had just about every option and less than 20,000 miles. Couldn’t pass it up. Great car." Image set of a 2017 Shadow Black 310hp 2.3L 4-cylinder EcoBoost Mustang. 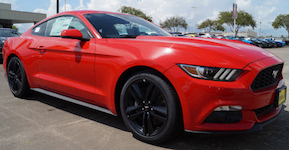 This is the baselevel EcoBoost Mustang for 2017 which has the standard 18 inch magnetic-painted machined aluminum wheels. Amazing photo set of a Triple Yellow 2017 Mustang with a 310 2.3L turbocharged (EcoBoost) 4-cylinder and 18 inch magnet-painted machined aluminum wheels.